One of the most common questions asked by AppleCheeks newbies is "How would they fit my child of "x" weight?" or "what size would my child need?". In general I feel the size descriptions hold pretty true to their claims. Size 1 fits from 7 (or even fewer) pounds until 20, and sz 2 from 20 to potty-learning. There is however a strange transition point for many children at about 13 lbs, many unmobile babies develop some serious thunder thighs at this point, but they slim down again once they are mobile. But fortunately AppleCheeks comes to the rescue again, and this is the perfect time to use extenders to achieve a perfect fit. So now without any further ado, a picture says a thousand words! Many people ask about the fit on a newborn. Evie was about 7 lbs even in this picture and 5 days old. Her diaper is stuffed with a 3 ply bamboo insert trifolded. That disposable diaper lurking in the corner was the last one she ever wore! Here she is at 1 month old. Notice we have moved out one hip snap but have retained the same waist snap as it moves further down the belly. At 4 months old, she is chunking up a bit and we have moved the leg and waist snaps out. This picture was taken when she was 6 months old. This was in fact the last day we used a sz 1 on her for awhile. She had entered that tricky thunder thigh category where we ran out of hip snaps! By the time she was 1 year old, the size 1s were the best fit on her again. We could also use sz 2s, but remember to pull those wings waaaaaaay up! At 18 months she was holding steady in sz limbo. Both sz 1 and sz 2 provided a good reliable fit. 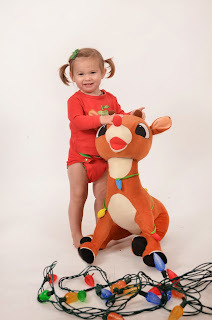 Now finally at 21 months and about 23 lbs, we have finally said good bye to our sz 1 diapers and are in sz 2s full time. Obviously Evie is a pretty slim child, and your child will most likely not follow the same pattern. 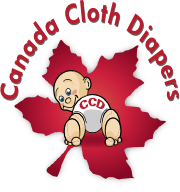 I hope this gives you a good reference for the way AppleCheeks diapers can be tweaked to fit any child at any stage of their development. 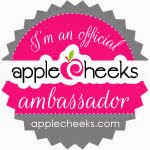 Please feel free to ask me or even AppleCheeks headquarters if you have ANY fit issues as everyone is always super willing to help out another Mama. Oh my goodness, your little one is absolutely adorable. I love seeing all the pictures of how she has grown. She hasn't changed much at all just gotten more hair and taller. Wow do they ever grow so fast. I love that you have stuck with one brand of diaper too. They must work really well for you. I used to be all for disposables until I heard about all the chemicals in them and how bad they are. Not to mention how bad they are to the environment.